These are all very quick pages that are slapped together. I mentioned that I didn’t plan for them, because I didn’t plan through the art process and did not envision how the final page would look like. They are all “in the moment” pages, representing my thought process or what I was doing at the moment I create these pages. 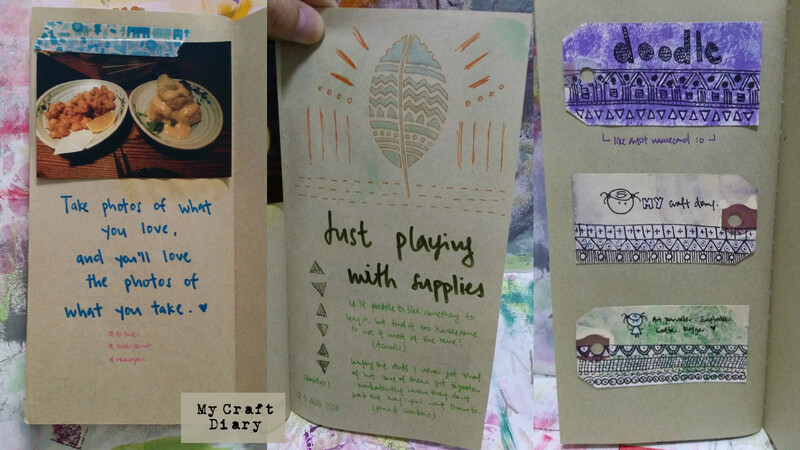 It’s organic, and uncomplicated, and it reminds me of the early beginnings when I started out art journaling, and my pages are just a slap-down mish-mash of things. Of course I would say that my pages now are more “sophisticated”, in the sense that I relate to the content more and it holds more meaning to me (in the past, my pages are just random things created for the sake of creating). You’ve seen this page in the previous ponderings post. I had the quote in mind, and that photo was lying around, an extra I accidentally printed. More than just a random photo, the photo really epitomises that quote, because it was taken during my Japan trip, and I actually didn’t like one of the dishes in the photo. 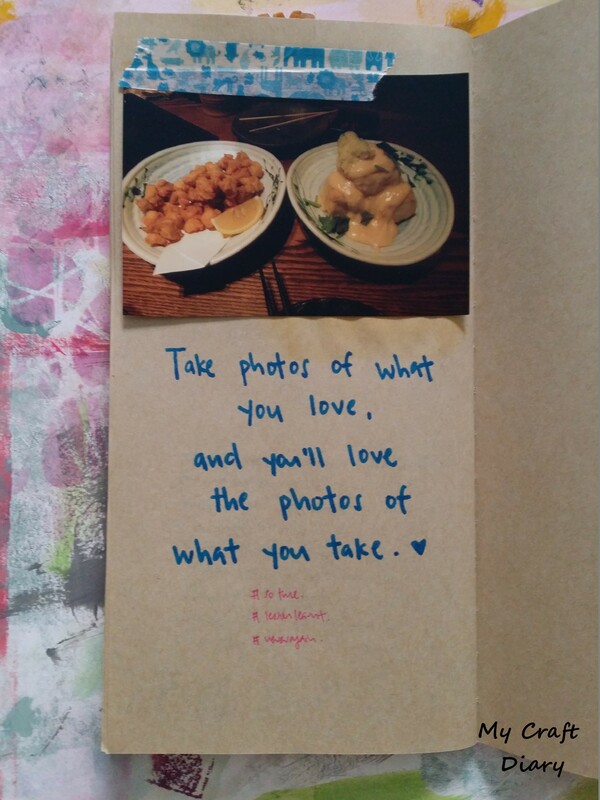 It was one of the few pictures I had of that meal and by lack of choice I had to choose it to put inside my travel journal. You noticed that the lettering didn’t come out exactly centred in the last line, and I added the little heart to balance it out. I use hearts a lot to embellish or fill up empty spaces because they work really well most of the time! I was playing with a new Crafter’s Workshop stencils along with some Distress inks yesterday. The plan was to try around blending the various colours and using all of the colours at least once, while trying out all the images in the stencil. At the end of it I filled up a whole A4 sheet of cardstock and was very happy, until I realised that there was one colour I didn’t touch at all. So I though I would do that in the traveller’s notebook since the A4 paper is all filled up already. 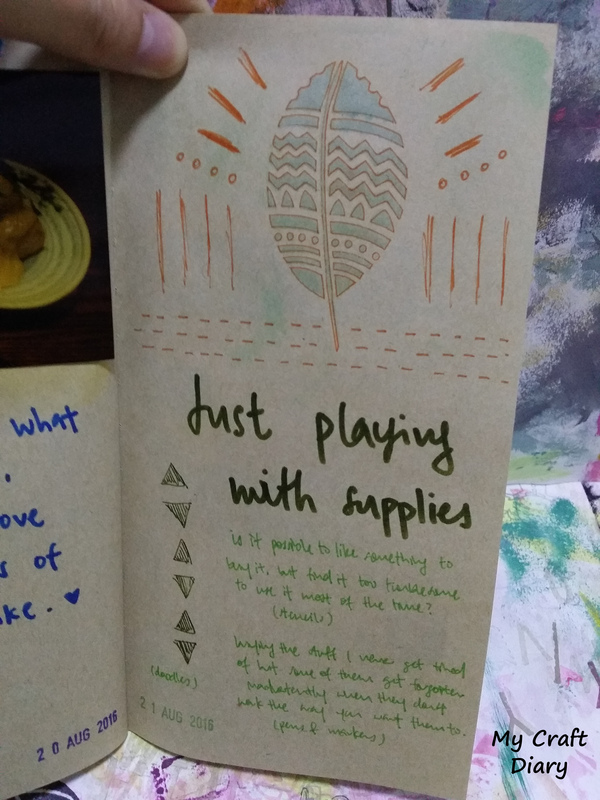 Unfortunately, kraft coloured paper isn’t too kind to light colours (it was peacock feathers), and the feather imprint was barely visible on the page. So I did the old school approach of tracing the stencil image with a pen, which ending up popping the image much better. I choose orange because it’s a contrasting colour to blue. The rest of the page was just random doodlings and me writing my thoughts about the supplies I’m using. Green was chosen for no other reason than I haven’t use the markers I chose in a long time. Today I was playing with tags. I have a whole bunch of painted ones sitting in a small drawer, mostly painted from leftover paints and what not. Among them were tags that I do not like for one reason or another, either the colour or the boldness, so they have been sitting around for the longest time as I don’t feel inclined to use them. So I decided that I will try to make them nicer and grabbed some stamps and gesso. Mostly I toned down the colours with gesso, and then did some subtle stampings. It kind of worked, since it improved from the original state, but I’m still not too thrilled with the results. 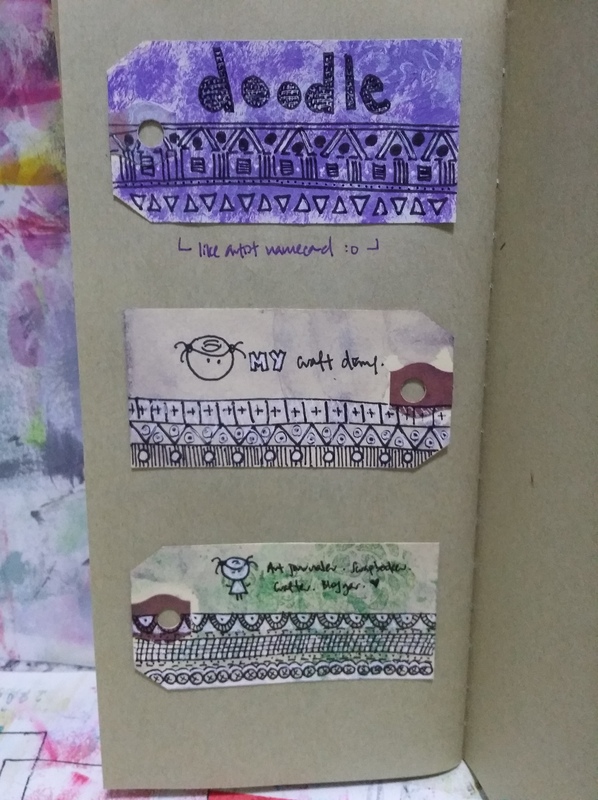 In a random moment while thinking of Julie’s art journal pages, I grabbed a pigment marker and doodled on the purple tag you see at the top. I’m not the best doodler, so I kind of ran out of ideas to doodle. In a serendipitous moment when I turned the doodled tag around, I realised that it actually looked really cool, and reminded me of a namecard. So I went ahead and did two more in truly a namecard style, and I really liked how it turns out! Which is pretty amazing, because I picked the tags I liked the least to doodle on, and just a simple segment of doodles transformed them into something cool looking. I believe I have now found the solution to utilising the many tags that I have stashed in my drawer! Another thing I would like to mention common in all three pages is my handwriting. I will confess that I don’t think my handwriting is ugly, though some days are worse than others. BUT when it comes to writing with markers, I find that I generally don’t really like how they look, because that’s when I try to do some fancy joined-lettering in an attempt to make it look nice and just ending up botching up the whole thing. In these three pages, I consciously tried not to do that, though it was simply because it’s easier to write them as I would normally (I don’t have to think much), rather than me wanting to not ruin the page. If you are like me, my advice is to just go with your own handwriting! Unless of course you have mastered some sort of fancy lettering, than please ignore me. It’s been a while since I posted. Mostly it’s a combination of not having anything to post/not feeling inclined to post either because they aren’t that nice to be posted, or they are too personal to be posted. Still trying to work my way around the personal part, but that’s another story for another day. There were two ways in which this quote struck me. Of course there is the literal meaning of the quote – that you will love the photos you take, if they are photos of things you love. In a rare moment of non-procrastination, I got started on my travel journal one week after I came back from Japan, which meant that I had to sort through my photos and look for the ones that I want to add to my travel journal. For the first time in a very long time, I could barely find any photos to include in my journal. Which is a shock, because I am usually indecisive in choosing photos, because I like so many of them (yet can’t include them all at the same time), rather than the opposite. It’s not that I didn’t like Japan, but during my travels, I was finding it difficult to really enjoy it and often I had to force myself to enjoy the things around me, rather than letting my heart wander to other places I rather be. The second thing this struck has to do with my daily photo taking habits. I might have mentioned in an earlier post before (I can’t remember), but I struggle with taking daily photos. I like the idea of Project Life, the whole documenting everyday moments, but I find it hard to justify whipping out the camera daily for that purpose. In a way I find it sad that I don’t find my life interesting to be taking photos like that, compared to the people I follow who always have something to document every week, be it just a good meal or a gathering with friends. Sometimes, I even find it hard to find something to scrapbook about, because most memorable moments aren’t crystallised in photos. It’s been an ongoing problem for me so far, when I get the urges to create, but have no idea or nothing to create. Uhm what’s my point in bringing this up? I don’t think there’s a point actually, just that I wanted to bring up what I felt with regards to this. Sigh. I’m still as passive as ever, and output is pretty much slow or non-existent. Haven’t been absorbing much too, if my backlog of YouTube videos is anything to go by. Have been doing random stuff lately too, and the photo above is just one of them, slapped together within 5 minutes or so before I need to leave for my dental appointment. Despite the short amount of time put into it, I really liked how it turned out though, likely because I really identify with the subject matter. Maybe I’ll talk more about it in a future post. I’m not sure. But it feels good to have the keyboard under my hands and hearing the clacking of keys as I type away.